As you sail toward the horizon you will feel the weight of work, school or appointments breeze out of your mind. Sit Back, sip a glass of wine, trim a sheet. Rest assured that in this time of big challenges you can be confident that you will receive the best value ever and an opportunity to ESCAPE from the daily grind.... Read More. Reason's for a Beneteau- Now More Than Ever. Beneteau USA will be launching a new series of vignettes with special incentives titled Reason's for a Beneteau. Stay tuned. If you would like to sign up for the vignettes' Visit: Sign Up. or for more information on call your Lake Michigan Beneteau Specialists at Karma Yacht Sales toll free 877-299-2537 for information on In-Stock Models. several out of town teams competing in the First 36.7 class. Mark Norris from Chicago, Chuck Bayer from Detroit, and Gary Tisdale of New York all made the trip west for the 2009 San Diego NOOD Regatta. Each team shipped out their own sails, running rigging and chartered boats to race this past weekend. All in all, there were fifteen Beneteaus racing, including ten 36.7s and five 40.7s. The 36.7 class raced Friday through Sunday; however they were only able to get in five races due to a storm that rolled in on Sunday. three bullets, as well as a second and eighth place finish for a total of 13 points. Ernest was followed closely by second place finisher Fandango, which was chartered by Gary Tisdale. One point behind Tisdale was Chick and Alexis Pyle’s Kea. The 40.7 fleet elected to race just Saturday and Sunday and were only able to fit three races in over the weekend due to Sunday’s weather. Cliff Thompson’s Super Gnat took first place with two bullets and one second place finish. Super Gnat beat out second place finisher R. Kirk O’Brien and his crew aboard Drumshanbo by one point! Rounding out the top three was Warren Gross’ Silhouette. Stay Tuned for First 40 Results There are currently four First 40s registered in IRC 1 for the Spi Ouest Regatta that runs from April 9-13. These new boats have been tuning up over the last few weeks and should really be dialed in by the time Spi Ouest rolls around. Courrier Zen, one of the new 40s that will be racing in Spi Ouest is owned by Gery Trentesaux. It was Trentesaux that dominated IRC 1 in the same regatta last year aboard the First 45 Lady Courrier. Although he has yet to reveal his IRC rating, Trentesaux’s Courrier Zen is expected to do very well in Spi Ouest and the upcoming regatta season. I’ll be sure to keep everyone updated as the results come in. already seven boats signed up. Encourage all First 36.7 owners to sign up early to help build excitement and participation for the regatta! This week's picture (s) of the week show the graceful transformation of the boat Endeavor (First 36.7 Hull #251) owned by Skip Schink and Rob Miller into her new shiny flag blue color. This custom paint job was done by Crowley's Yacht Yard. Skip and Rob are Shield's sailors new to the First 36.7 fleet. They will be starting their first season of OD racing in the fleet this Spring. Finished Product. Nice Shiny new Awlgrip Paint job in Flag Blue. Sternview- Still needs additional striping at the waterline. This week's Picture of the Week is Dave and Marsha Gage's 2005 Beneteau 423 named 'Grace'. On a day when the 'wearing o' the green' is popular, Grace is just that. Her custom Imron paint job and white accent has her sporting the color of the day. She truly sails the color well. Happy Saint Patrick's Day! As a full-service dealership, one of the many benefits of working with Karma Yacht Sales is that we take care of all the details related to the purchase of your new or brokered boat. If you are looking to finance your boat, we can help put you together with a lender that meets your needs. At KYS, we've seen more cash deals or self financing as of the past two years. Financing is still being used however, one of the most common misconceptions in the marine market today is that there is a scarcity of lenders out there. While it is true that in 2008 there were some lending institutions that elected to depart the marine financing industry, scarcity is more of a perception than reality. Everywhere you turn, the uninformed media loves to speak of the marine industry as a generalization (Identifying both Power and Sail as one). Sailboats make up less than seventeen percent of the over $22B retail recreational boating market. The default rate on sailboat loans is less than one-percent. The power boat sector of the market is being impacted at a much higher rate by this fact of the current economy. They also represent a larger percentage of the boating market and industry. Like anything, it is always the cry of 'fire, fire' that grabs headlines. Reality is far removed from the sound bites afforded by the lay and some of the marine press. Recently,We had a chance to catch up with some of our Marine financing experts. We asked some key questions of two of our experts, Chris Hungerink and John Dierkson, regarding their impressions of the current marine financing landscape and what they are seeing. We hope that is will serve to further educate the boaters in Lake Michigan of what is Fact vs. Fiction. KYS: What are you seeing in the marine market today? Dierksen: We are seeing activity across the Great Lakes. I can't say that one size range in particular is gaining. People are buying. Hungerink: People are buying. There are some good deals on in-stock boats out there and real buyers are saving money. KYS: What are some of the factors influencing the market outside the obvious? Dierksen: Alot of what we are seeing is misinformation on behalf of the people applying (or not applying). People still think that the 'easy financing' of the recent four years still applies. It is back to lending basics. Hungerink: Dealer inventories represent good deals for buyers. In some cases over brokered boats. Buyers need to select their selling dealers based on sound criteria: service reputation and business history. KYS: What is different today versus one-year ago? Dierksen: Not much, I'd qualify that as compared to as recently as two-years ago. Documentation is king. Lending is back to the basics. There is still money to lend and it's flowing for qualified buyers (i.e. good FICO scores). Lenders ARE lending. Hungerink: I'd agree. The bigger item is that people hear of the low prime rate or residential retail rates and immediately believe the marine rate should correlate. It's lower than it's been, but no where near what residential retail is at. It's trending at 1 to 1.5% higher than the residential rates. KYS: What is the standard criteria for borrowers these days? 1. FICO credit score of 720 or better for the better rates. 2. Two year's documentation of income. That's taxes, pay stubs, K2's for loan's under $100K. Over $100k, some lenders may require a personal financial statement (pfs). 4. Good debt to income ratios. (not overleveraged). 5. Loan to value ratio (LTV) of 80 to 85% of the value of the boat. It's much harder to hit with used boats. If all that is on board, the process goes fairly smoothly. Hungerink: I agree. I might add that if a trade-in is involved, the buyer may still be asked to put money down by the bank. The LTV is what they are looking at. That's easier for new boats for used they may estimate lower values. This applies to trade-ins too, they are basing them on lower values. KYS: What key points should today's buyers be aware of? 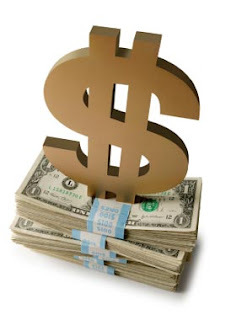 Hungerink: There is money out there to loan. The doom and gloom is spin. Be ready to document and there are deals for people willing to commit. Dierksen: Smart money is buying now. The rates will not get better, if anything, they may creep up. So there you have it. In the words of our financing experts. Now more than ever, there are deals ready to happen. Opportunities to save on in-stock boats is money in the buyer's pockets. Advantages over non-stocking brokers are endless. Our 4th quarter of 2008 closed out at a brisk pace. 1st quarter 2009, has been a flurry of activity in patches. There are people buying- are you one of them? Contact us to find out what the latest rates are on new and brokered boat purchases. Kermit the Frog once said - “Itʼs not easy being green”. Maybe Kermit was a boatbuilder at some point in his life. Had he been, he would have known how true that statement was - and is. Components such as petroleum based products, lead, andwood from rain forests have routinely been used to build modern sailboats for a longtime, and most manufacturers still do use these things, partially from necessity and partially from choice. The reality is that ﬁberglass boats must be made using materials that arenʼt always the friendliest for the environment. But the other reality in sailing is that the end product is quite environmentally friendly. Sailboats use very little fuel, and are mostly self contained under way, so pollution and sailing are rarely used in the same sentence. Thatʼs obvious, but letʼs go back to the manufacturing process and look at the things that make Beneteau a better and greener manufacturer. Starting with the layup of the hull and deck, Beneteau is ahead of its competitors in using more environmentally friendly techniques such as injection molded decks on most models. Injection molding does away with the spraying of polyester resin into an openmold, which creates a large amount of styrene infused airborne residue that is not a particularly good thing, as you can well imagine. Injection molding incorporates a 2 piece mold into which precise pre-cut pieces of dry ﬁberglass are applied. The two pieces of the mold are joined together and resin is injected evenly into the mold and forced throughout the piece to ensure even penetration and saturation of resin into the glass. This process has a dual beneﬁt - it guarantees much more consistent pieces in terms of weight and ﬁnish, and it eliminates all airborne spraying of resin, making a cleaner and safer workplace as well as a better product. This is a process pioneered by Beneteau and is used by very few others in the business because of the added expense to create the tooling and to implement the process in older manufacturing facilities. The beautifully ﬁnished interior wood used by Beneteau, called ALPI, is created from veneers made from natural hardwoods grown in managed sustainable forests. It is a processed multi-laminar wood which is consistent in grain pattern and color, making it easy to repair or replace if necessary. The process involves using thinly cut veneers which are selected based on color and grain quality. The veneers are then put into piles and immersed into tanks containing pigment to obtain a light and homogenous tint.They are then immersed into a second tank of pigment to obtain the ﬁnal color and to stabilize the color against UV rays and to seal them. Once this is done, they are sorted again to a chosen grain pattern, stacked,and glued using a proprietary waterproof glue into solid blocks of wood. This is the base for the ALPI product. The blocks are then “sliced” very thinly on an angle, and the angle of the cut determines the grain width and character. The ﬁnished plies of wood are fully ﬁnished end grain pieces that are uniform in appearance and resistant to impact, thanks to the glue and compression incorporated into the manufacturing process. Beneteau then takes an extra step in the process and cuts the existing plies at another angle to add even more impact resistance and consistency in ﬁnish. The ﬁnished are then sent to the plywood manufacturer to be glued onto Class “A”sheets of marine grade laminates. These ﬁnished products become the beautiful bulkheads and cabinetry that are the signature of Beneteau boats. While this is a much more expensive process than conventional methods used by most builders, the end result is a higher quality and harder ﬁnish than one would expect. Beneteau has also been a leader in using cast iron for its keels rather than lead, which is much more toxic to the environment and not as durable in cruising boats. Cast iron keels will stand up to running aground without bending or losing their shape, which is a problem with lead, not to mention that the expense and restrictive rules of lead use are making cast iron the smart AND green choice for modern cruising boat keels. These are but a few of the ways that the worldʼs largest manufacturer of recreational sailboats, Beneteau, is contributing to a healthier environment, both in theirmanufacturing plants and on the water. Good and green sailing to you! Holding true to our belief of not upholding the status quo, Karma Yacht Sales launched their Facebook page and Twitter link today. As the value of social networking continues to evolve, Karma Yacht Sales continues to lead in new innovative ways to help the sailing community in the Lake Michigan region and the Chicago area. Our goal is to continue to bring value to our customers through many of the Web 2.0 features available today. In doing so, we will continue to differentiate Karma Yacht Sales from the competition and help keep the Lake Michigan Sailing community informed. One of the challenges in growing the sport of sailing is accessing emerging markets. It is our opinion that there is a huge disconnect in the sport. As leaders in the industry, we are doing our part to help include the up and coming generation(s) into the sport of sailing. Social networking, along with our webblog (a.k.a blog) are ways in which we continue to lead the market. Our Facebook and Twitter links allow our many 'customers on the go' and active sailing afficionados the opportunity to keep up to date on what is happening in the sport. Feel free to click on the links at the bottom of this blog posting to 'become a fan' of KYS on Facebook (requires you to sign up for free) or 'to follow KYS' on Twitter. Many sailors have the ability to follow the social networking sites via smart phones which have become de riguer. Our blog also has links in the right margin where you can sign up for Facebook, Follow us on Twitter or keep yourself informed via our e-newsletter. Facebook is a social networking site that allows you to keep in touch with your contacts by a process called 'friending'. Twitter is a microblogging service that allows users to keep themselves informed through updates (a.k.a 'tweets'). Built from the Drawings Up. Building a sailboat is not too different than building a house. Both need blueprints before they can properly be built. Naval architects are the equivalent of their home-designing namesake, as they design the boat from the keel up. WHile I promise not to bore you with details, over the years sailboats have evolved to become divided into (arguably) four different styles: racing sailboats (small to large), racer-cruisers, performance cruisers and, lastly, the ‘floating RV’. 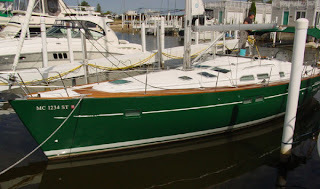 Speaking about boats that are larger than thirty feet, for many years the sailboat manufacturers commissioned their naval architects to design boats that would 'do it all'. They tried to make performance boats that had great interior comfort, lots of storage space, an abundance of amenities for living aboard, etc., but they were also attempting to make these boats go fast. This method and mindset met with very limited success, as something was always missing from the boat and more often than not it was performance. When Beneteau began building sailboats, nearly all of their designs exhibited a performance-oriented spirit and personality. These characteristics won over the hearts of many true sailors without abandoning those sailors who also wanted the boat to have a lot of comfort and amenities. Over the years, as their company evolved and grew in popularity, Beneteau began to build even larger boats that featured more and more of the lifestyle amenities that Europeans and Americans wanted. This is where Beneteau began to set themselves apart from their competition. Their competition mostly uses their own in-house architects to build each of their models. While using the same person to design boats is probably a cost-effective way of operating, there is very little differentiation among models if you have the same person designing each boat year after year. What Beneteau started doing early on was to commission the world's best naval architects to begin designing their boats. Rather than continue on the same path that might lead to stale designs and stale products, they hired some of the best NA's the world had to offer. The designs and boats that resulted from this marriage exhibited all of the same performance aspects that had won earlier hearts, but the boat’s interior and amenities were now also elegant and impressive. There was a way to address both performance and style. For as long as I have known of them, Beneteau’s designers and naval architects have always prided themselves on the fact that they build their boats from the drawings up, meaning that their first thought when designing and drawing the boat is for it to sail well, for its performance, stability, and safety to be the most important aspect of the boat that results from the drawings. Once this foundation is in place, the interior will be designed and the amenities selected. Many manufacturers have gotten away from this very basic rule. I am not suggesting that Beneteau is the only manufacturer doing it this way (there are other brands that also use the world's best to build their boats, but they are significantly more costly). 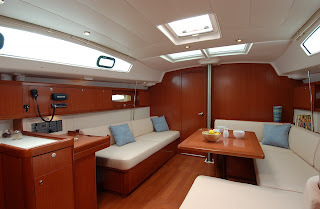 But Beneteau has earned much respect because they have never succumbed to the belief that performance and amenities are an either/or conversation, and they have produced a countless number of models to exhibit this as fact without ever producing a sailboat that resembles a floating RV. What Beneteau also did in the mid-eighties was to create two different divisions: the Oceanis line of performance cruisers (in the USA it is now known as the Beneteau line), and the First line of racer-cruiser sailboats. 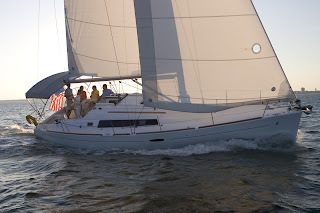 The Beneteau line has remained true to the idea of a performance-oriented cruising boat and the many amenities that are available, while the First lineup appeals more to the segment of sailors whose preferences lean towards racing without giving up some of the more comfortable aspects that a boat can have. This was and is a fine line, as both series of boats are well-appointed. But the major differences are found mostly on deck, in the cockpit and hardware layout, and also in the sail plan. Performance cruiser is a term that is used frequently in the sailing industry. It’s the kind of term that many sailboat manufacturers like to try to associate with their models, but the proof is in the polars, so to speak. 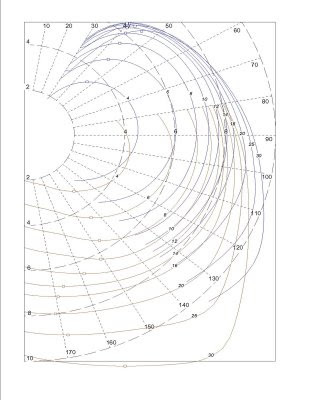 Polars are the performance prediction tables that are created by the naval architect. It is a report generated by taking the boat’s design (hull shape, keel shape, keel weight, sail area, rudder depth, etc.) and mapping that data against the different variables of wind speed and wind direction. For instance, if I am sailing at 90 degrees off the wind and the windspeed is 15 knots, the Polars will tell me exactly how fast the boat will be moving if I have the sails trimmed properly. Polars are quite important to the racing and performance-oriented sailors, as they are the boat’s speedometer, tachometer and more, all rolled into one. 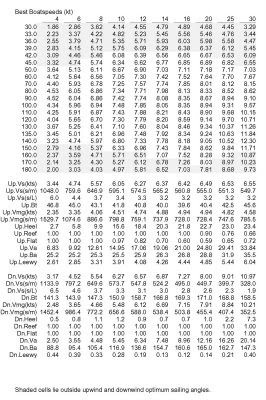 Why this matters is that Beneteau has always generated performance polars for their cruising models. While they are generally boring-looking tables (and also a visualization chart, which I included), they offer very significant data for anyone who wants to know how a certain boat will perform. Polars also help an owner to maximize their boat's potential, as they can also act as a legitimate 'cheat sheet' for learning how to trim your sals for your boat's best performance. As Beneteau dealers, we are proud to represent a brand that believes in and offers this information to their prospects and customers. What it says about their manufacturer is that they pay attention to every detail during the process of building each model whether it is a racing boat or a performance cruiser. There's that performance cruiser term again. But Beneteau has earned the right to use it, because it is true. In a true testiment to Lake Michigan Sailor's love of Sailing, we have seen a bit of a resurgence in the popularity of the First 10R in the past few months. We have had the opportunity to sell our stock First 10R and one other ordered boat from the factory*. The design has found a renewed level of support among individuals who like to short-hand sail or race open section. A recent revision to the PHRF rating for the boat to 78 has also contributed to her appeal. While many would ask, what people are thinking about, buying a boat in this economy, it is a testament to the fortitude of the sailing community. Many of the buyers for these boats and the other boats we have sold this year (so far) have been surprised at the great pricing they have gotten on their purchases. A savvy sailboat buyers would be, these owners understand that is very important to buy not only for price, but some of the other intrinsic values in sailboats (a topic for another article). The First 10R is a unique boat that first captured attention when it was launched in December 2005 at the Paris Boat show. The boat made it's United States debut at the U.S. Boat Show in Annapolis- October of 2006 (as a 2007 model). The boat was originally designed with the possibility of one-design however it's appeal seemed to be with short-handed sailors and open section racers. Here in Lake Michigan, the boat saw success by winning it's mixed section in the 2005 Verve Cup. She competed in a mixed fleet with boats that ranged from the older design Beneteau First 42 to the C&C115. This happened in spite of the fact that the First 10R originally had a provisional PHRF rating of 72 seconds per mile. Tough for a boat with a waterline length of 28'8". She competed in a mixed section with boats ranging from 1.25 to 1.5 her LWL. Proving that she is no slacker, the design continues to win. In Winter 2007, she won the United States PHRF championship at Key West Race week . "Tallgrass" (hull #24) had some early success in port-to-port racing with a second place section finish in the 2007 Race to Mackinac (corrected down from 1st). Our fellow Great Lakes First Dealer, RCR Yachts has also reported a resurgence in F10R sales as of late. KYS had some early success with the First 10R in Lake Michigan with one local sale and another in Southeast Wisconsin. The two most recent sales make four total. We are currently speaking with two other possible buyers, so the second wind continues. Notes:*The Beneteau USA Marion, SC facility currently has three other 'ready to go' boats on hand. Minor modifications can be made in options packages in time for the '09 season.